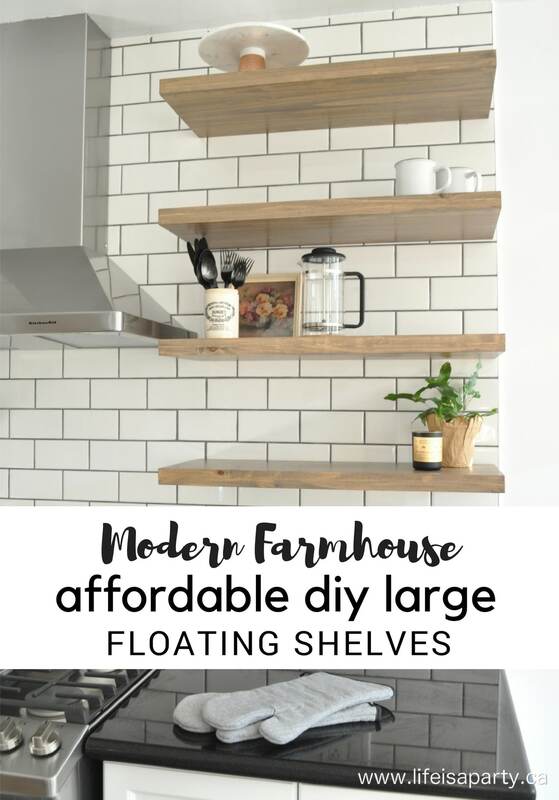 Want the Modern Farm House look of large floating shelves but can’t afford them? 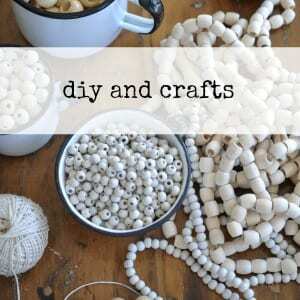 DIY them with plumping supplies and 1″ x 12″ boards. 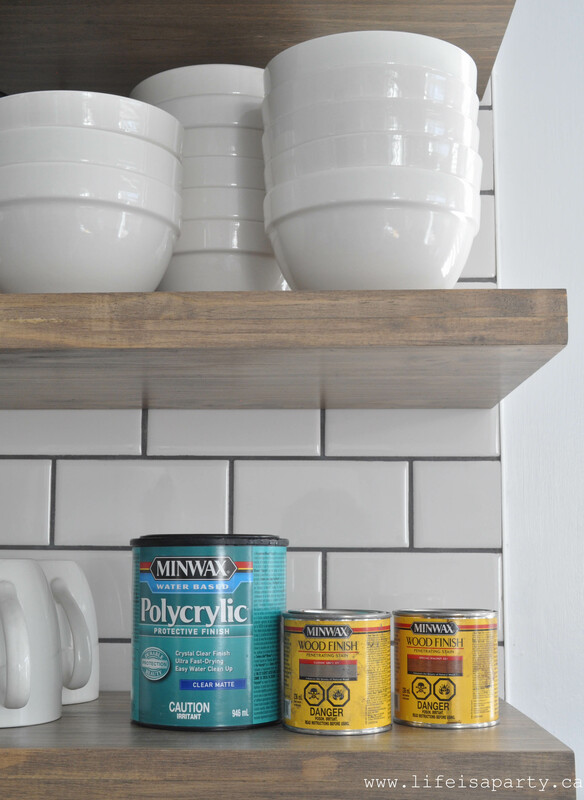 Today I’m sharing my Affordable DIY Large Floating Shelves for my Kitchen Makeover. It’s week 6 of this 7 week makeover for this fall’s One Room Challenge hosted by Calling It Home. 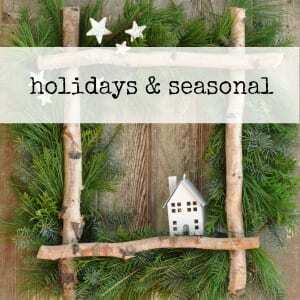 Be sure to check out all the other bloggers progress at Calling It Home. I’ve been making over my kitchen and it’s almost done. 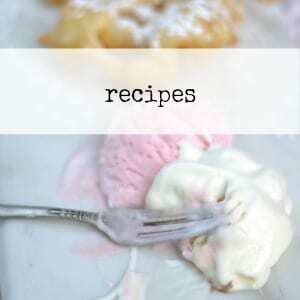 Next week will be the big reveal, and I cannot wait to show you how great it looks! 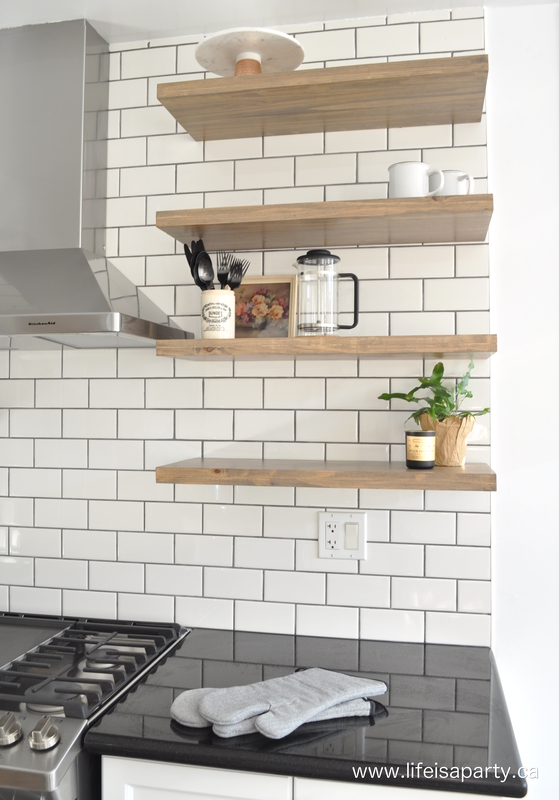 This week I’m excited to tell you how to DIY large floating shelves and do it on a budget. During my design process I decided that I wanted to take down my existing upper cabinets on either side of my range hood and replace them with open shelving. I felt like it would be a great update to the kitchen and as someone who likes to change their decor often I thought it would be a great spot for display. 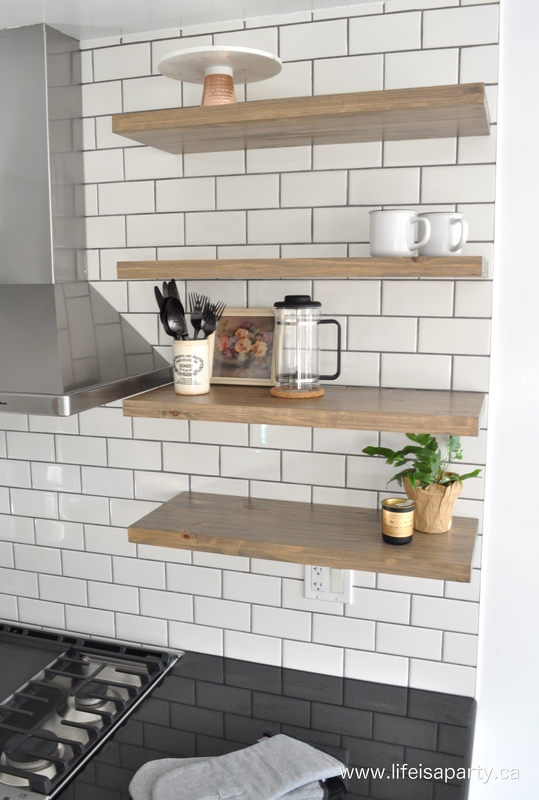 I was planing to change our existing backsplash to subway tile, and thought that extending it up the entire wall behind the new floating shelves would look great. My brother-in-law Shaun of Benjamin Woodworks is a contractor and he did all the building for this project for me. 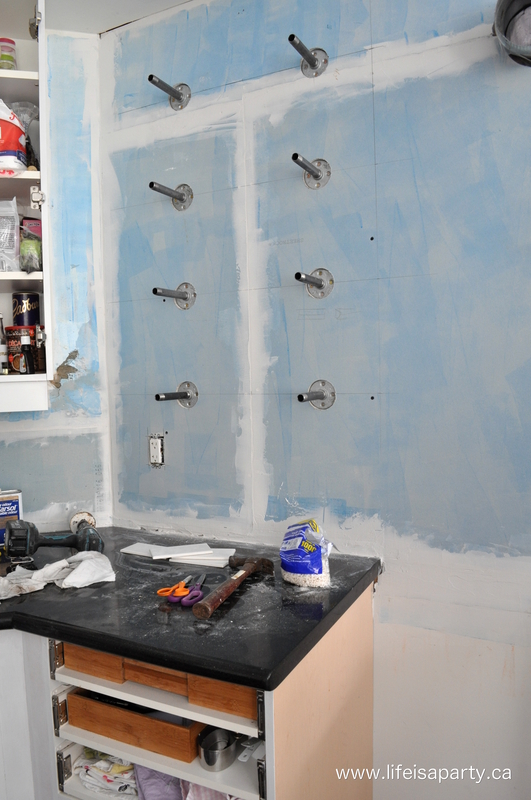 Removing the old tile backsplash in the kitchen damaged the drywall, and we ended up having to replace it, so while the walls were torn apart, we added in some reinforcements for the shelves. I knew I’d be using the shelves for all my heavy plates and dishes and didn’t want to be worried about it ever falling down. Shaun notched out the studs and added in some more 2 x 4 in the our predetermined locations of the shelves, so that we’d be able to attach our shelf hardware directly into it for added support. After the blocking was added to reinforce the wall we added our new drywall. To create the floating shelf supports we used plumbing supplies. We thought about a lot of different options for the floating shelf supports. We had trouble finding anything large enough. The floating shelf supports we could find were only for a 6″ deep shelf. I knew I needed 12″ deep shelves in order for them to be deep enough to hold dinner plates. We did find some larger ones that were handmade in a little shop on-line, but they would have been very expensive for our 8 shelves as each needed two supports, for a total of 16 supports. We thought about having some custom welded for us, but again it would have been very pricy for 16 supports. In the end Shaun came up with the idea of using inexpensive plumping supplies, and it worked out great. 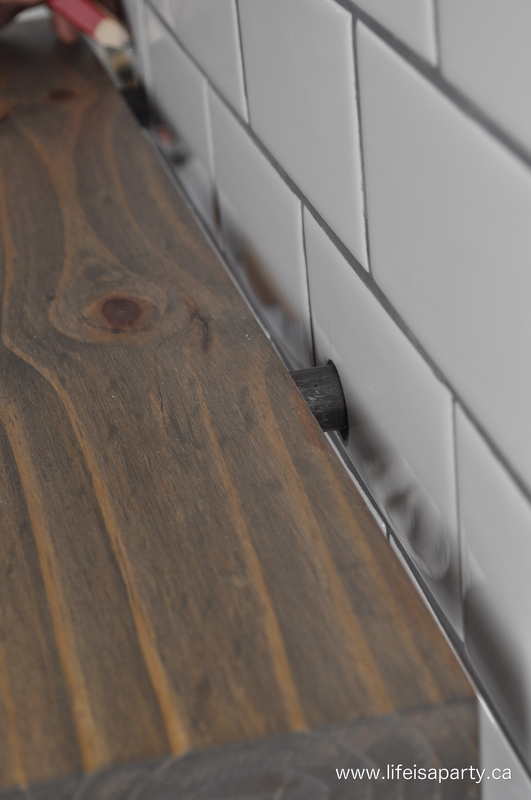 We used 1/2″ galvanized flanges and screwed 1/2″ x 6″ long threaded pipes onto them as the shelf supports. 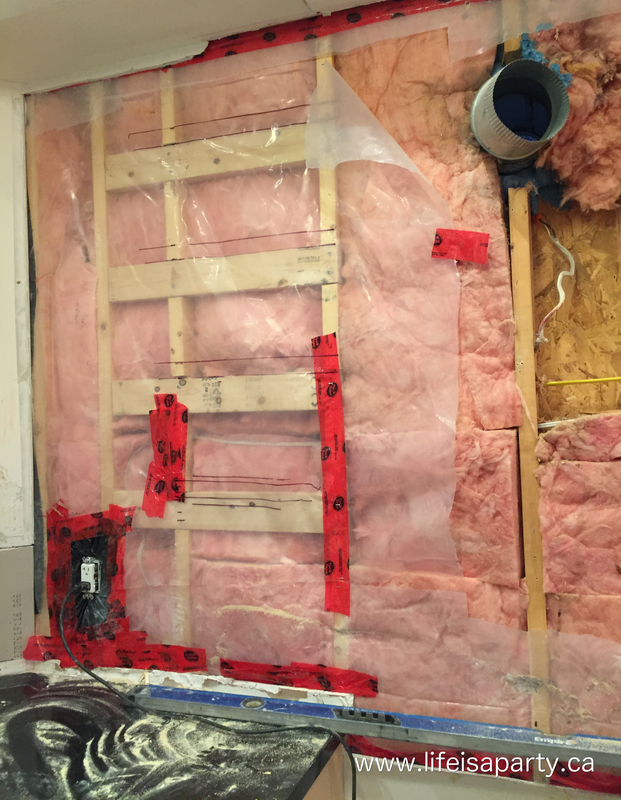 Shaun then used a 2 1/8″ hole cutter in a drill to cut the dry wall out and attach the support to the wall where it had been reinforced. Shaun used a level to make sure that all the pipes were level and straight at this stage. 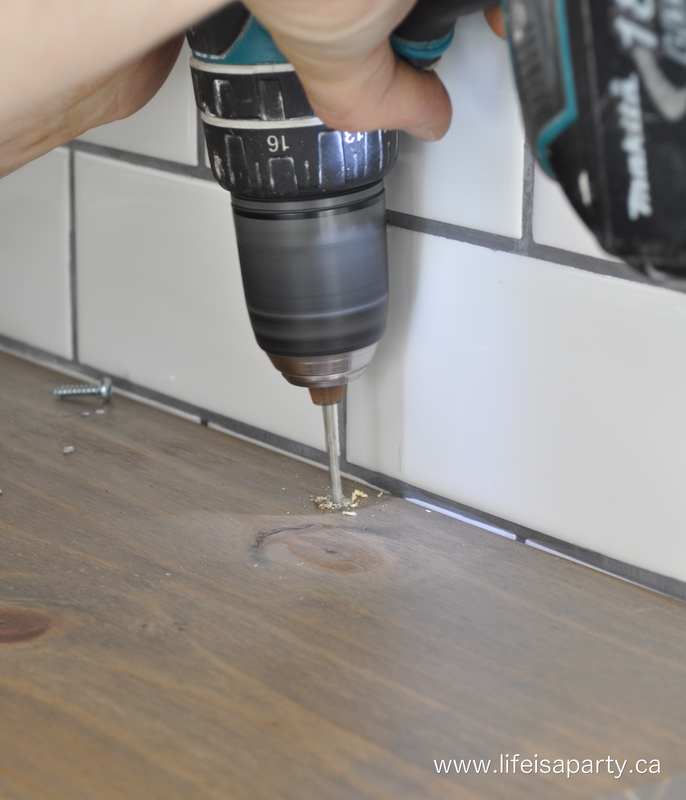 When we did the tiling, we tiled right up to the pipe, and then Shaun used a 1 1/4″ diamond drill bit for the tile to cut out a hole for the pipe to go through for a really clean look. To make the actual shelves we picked up some 1 x 12 pine and cut them to 28″ lengths. Shaun used a router to cut channels for the posts on each side. Then two of the boards were glued and clamped together to create 2″ shelves, with routed holes in the back to accept our pipe shelf brackets. We could have used 2″ pine boards to create solid wood shelves, but we didn’t think that was the best choice for a couple of reasons. It would have been difficult to drill perfectly straight holes into the back for the pipes to fit into. If the holes weren’t perfectly straight the shelves won’t have been level. It was also much cheaper to buy the 1 x 12 boards, and it really looks great, so it was a real win-win. I sanded the shelves and then conditioned the wood with Minwax Pre-Stain Wood Conditioner, since we were working with pine and it accepts the stain more consistently when the wood is pre-conditioned. Then it was time to stain the wood. 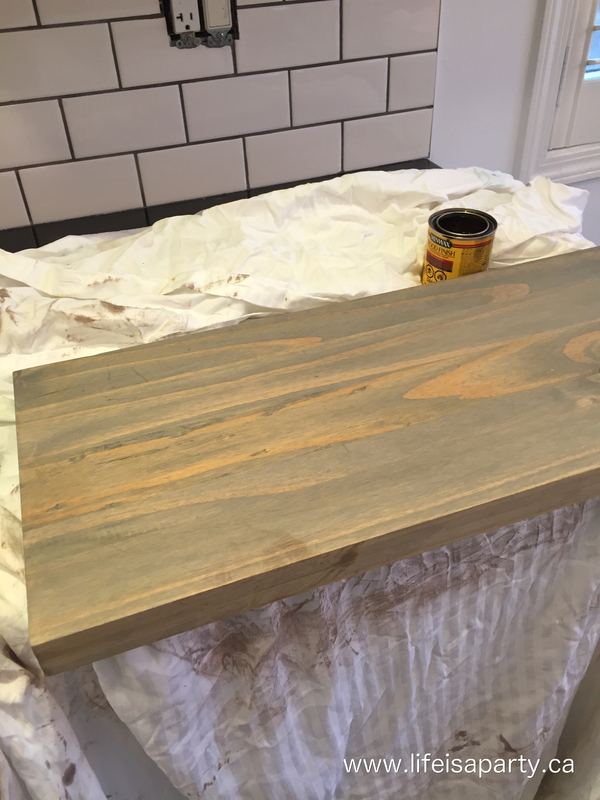 I used Minwax Classic Grey and followed that with a light layer of Minwax Dark Walnut to add a bit more brown. After the stain was dry I sealed it with Minwax Polycrylic giving each shelf three coats. I love using the Polycyclic Protective Finish because it has a matte finish and doesn’t look yellow at all when it dries -the soap and water clean up is a real plus too. Shaun installed the shelves. He started by making minor adjustments and getting the shelves perfectly level with some small wood shims around the pipe where needed. Next, to secure the shelf to the pipes, he drilled a hole through the top of the shelf and into the top of the pipe. 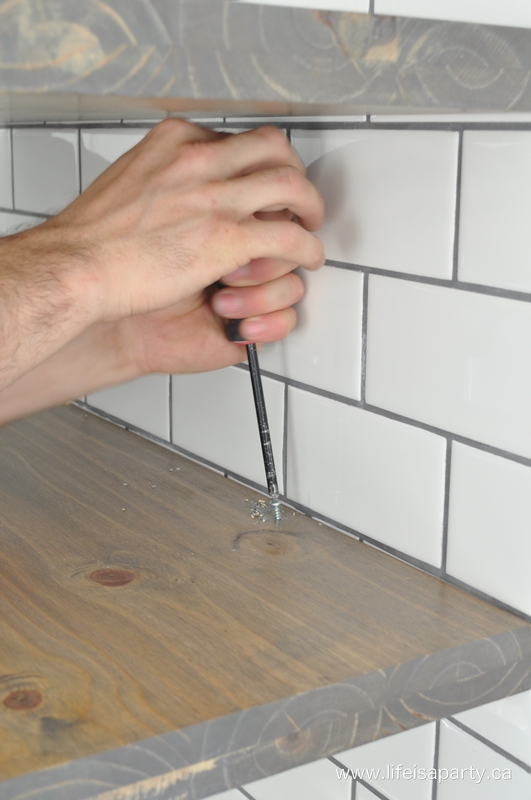 He screwed 1/8″ x 1″ metal screws into each bracket to hold the shelf firmly in place. Since the bottom shelf is eye level, he secured it from the bottom so it won’t be visible. The rest are done from the top so they’re not seen either. 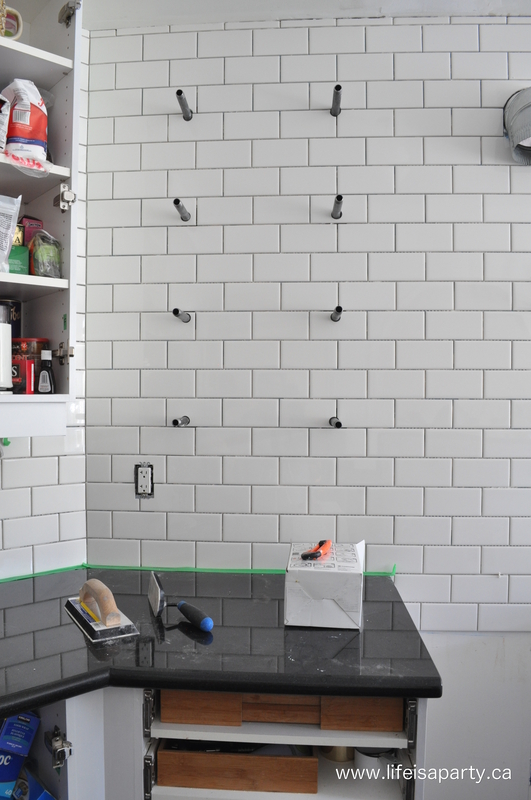 I love the Minwax stain colours and how great the greyish shelves look with the dark grey grout from the backsplash. Shaun did an amazing job of making my vision come to life on a budget. 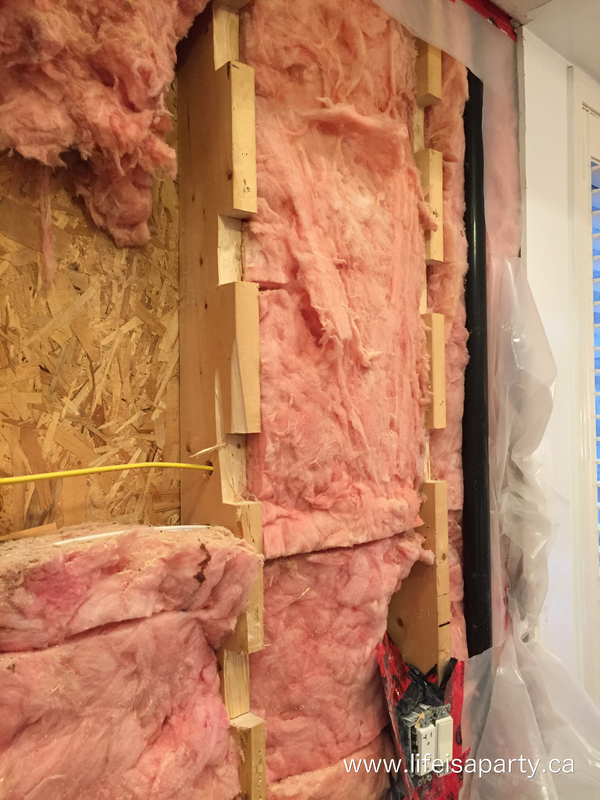 Using the plumping supplies and the 1″ x 12″ pine boards really helped our budget. If you’re trying to find the look but need to do it on a budget, I hope this idea helps you as well. The finished shelves look amazing, and I am having so much fun styling them. 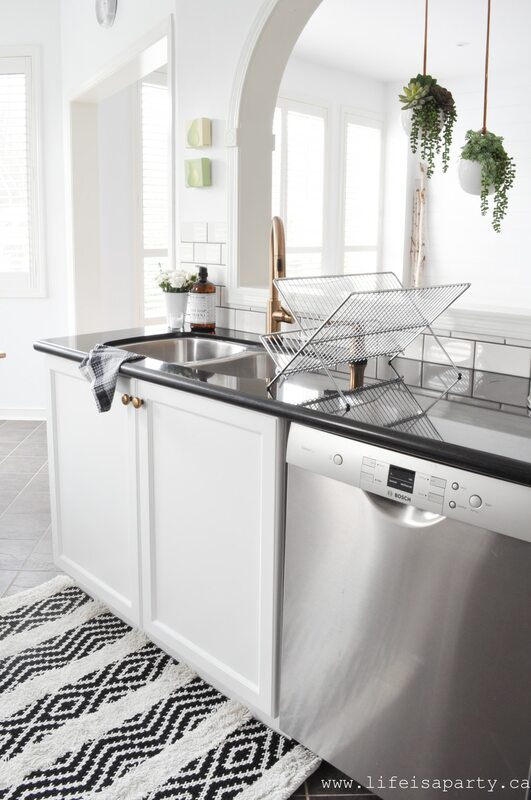 Next week is the big reveal of the finished the kitchen and I can not wait to share it with you. 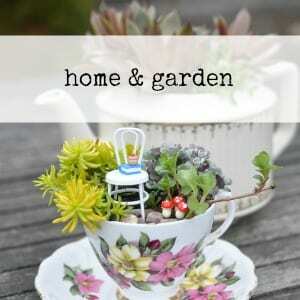 It has definitely been worth all the hard work, and having our house in a bit of chaos for the last six weeks. Follow me on Instagram and check out my stories for some sneak peaks of the finished kitchen. 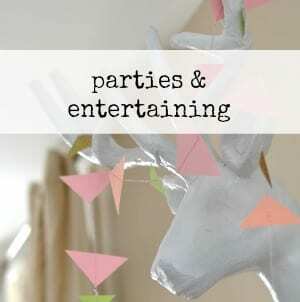 With new Modern Farmhouse Affordable Large DIY Floating Shelves, life really is a party! 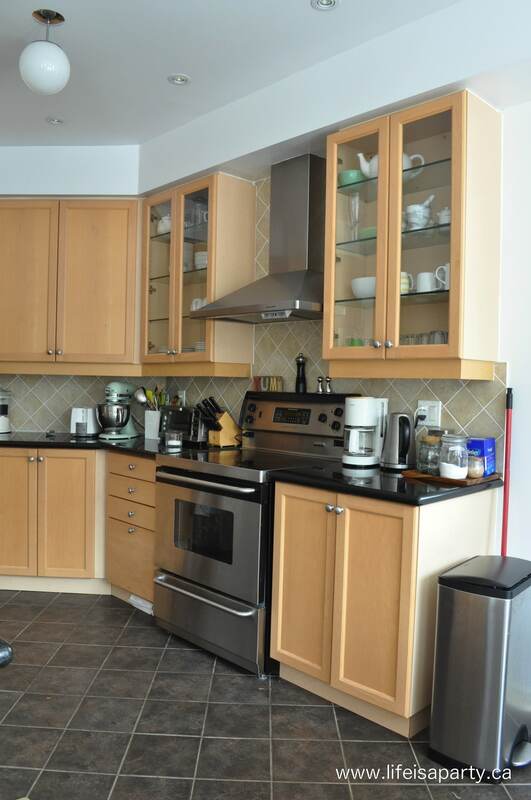 Oh I love those floating shelves. 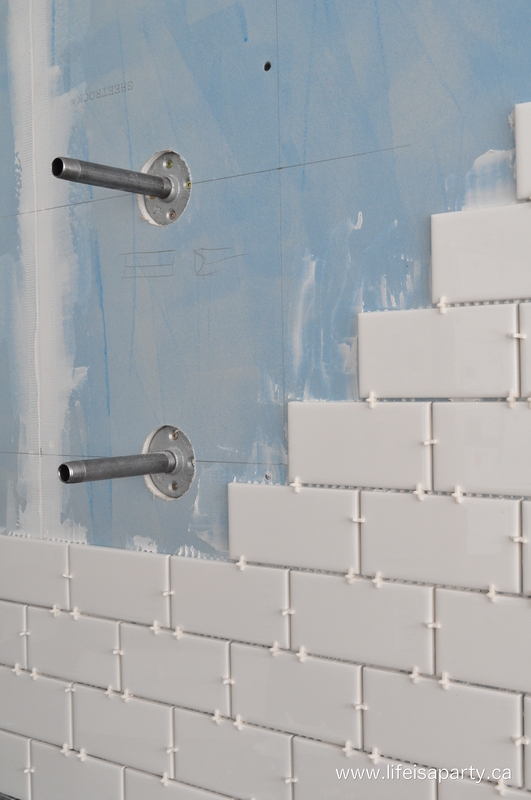 You guys worked hard to get those base brackets in, I was wondering about that when I saw the first picture, then I scrolled down to see the tile work in progress and it all made sense. Great job!!! 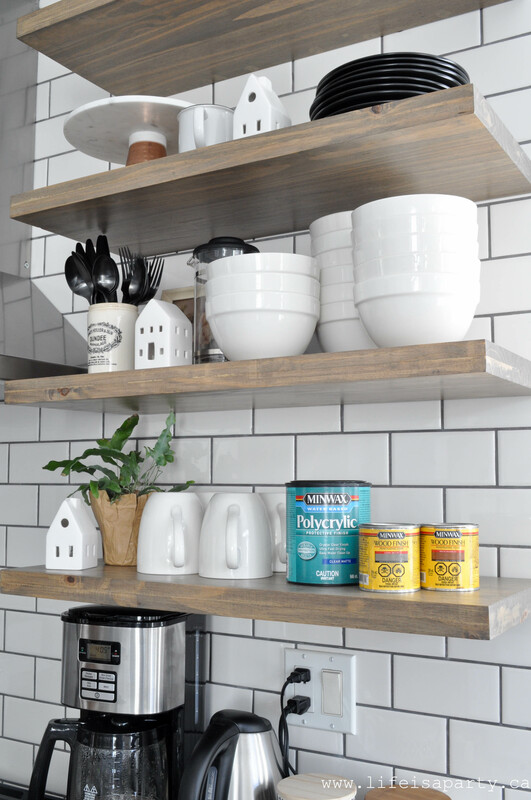 I love the stain color you chose for the shelves – and bracing them underneath the tile by adding more studs is genius!! Looking forward to seeing the finished room! 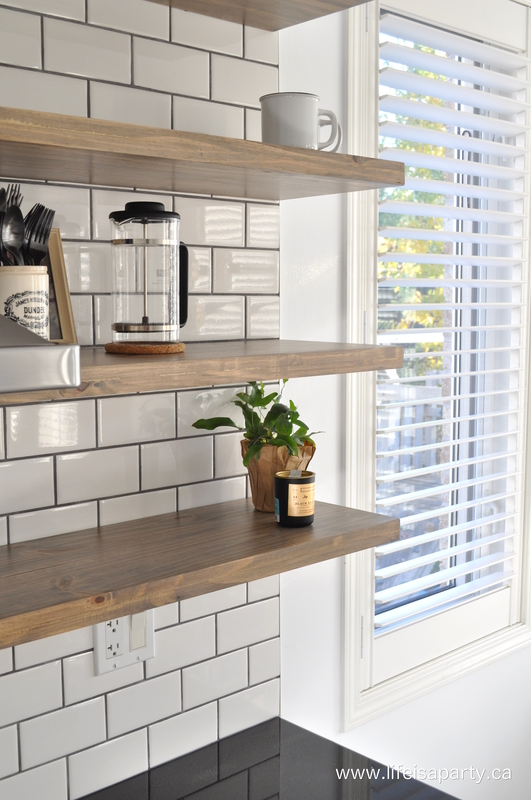 Your shelves and subway tile look awesome!!! I can’t wait to see the entire reveal next week!! Thanks Jen, one friend said she saw the first picture and thought we were putting in a climbing wall -haha. Kelly thank so much. Glad you like the colour, it’s coming together. Emy, thanks so much. I had some major help with the tile…infact he more like did it and I was the helper. It was hard work, but I seriously love it and am so glad we did it. Thanks again. Wow, you must be so pleased!!! It’s looking phenomenal, I can’t wait until next week’s reveal! Thanks Laurie, yes I really love them. It was so fun to style them and now I can’t wait to decorate them for Christmas. Your shelves look amazing! I love that you used pipes for your supports – what a great idea! The shelving looks amazing!!! I would have fun styling that too! I can’t wait to see the whole kitchen later today! Thanks Lindi, I’m sure you’d have a ball styling them too -and they would look amazing!